Dr. Qazi Kholiquzzaman Ahmad, the Chairman of Institute for Inclusive Finance and Development (InM), a renowned socio-economic specialist and development thinker and practitioner of international repute, has been keenly promoting sustainable development in all its aspects. 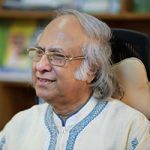 In a career spanning over four decades, Dr. Ahmad has extensively participated in research activities and dialogues, nationally and internationally, covering different social, political, economic, and environmental aspects and issues of sustainable development as they relate to Bangladesh and other developing countries. He has also been concerned in his research and related activities with governance with respect to both the nation state and the international system. He has, over past several decades, relentlessly sought and promoted ways of achieving socially inclusive development. In this context, major focus of his research, action research, advocacy, and mobilisation activities has been covering issues related to reducing poverty and disparity in a sustainable way, and promoting equitable economic growth, sustainable employment generation for the downtrodden, empowerment of the downtrodden through education, training, and health services, establishment of rule of law; human rights, and environmental security. He has to his credit a wide range of research works on policy planning, food and agriculture, environment and water resources, rural development, poverty alleviation, human development, technology and employment generation, women in development and gender issues, etc., including 35 books and over 200 learned articles by himself or jointly with others published at home and abroad. Dr. Qazi Kholiquzzaman Ahmad is the current Chairman of Palli Karma-Sahayak Foundation (PKSF) and the founder Chairman of the multidisciplinary research organisation Bangladesh Unnayan Parishad (BUP). He is also the Chairman of Governing Council and Director of Dhaka School of Economics (DScE). As Co-Chair of the 2010 National Education Policy (NEP) Formulation committee, he played the key role in formulating the NEP 2010, which has been acclaimed widely in the country, across political persuasions. He has been Regional Chair of Imagine a New South Asia (INSA), a people-centred process of South Asia regional cooperation and development. He is the former President (2002-2010) of Bangladesh Economic Association (BEA), and a former Research Director at the Bangladesh Institute of Development Studies (BIDS). He was the president of the Kuala Lumpur-based Association of Development Research and Training Institutes of Asia and the Pacific (ADIPA) and was Vice President of the Rome-based Society for International Development (SID). He participated in the Bangladesh War of Liberation in 1971 and worked in the Planning Cell set up by the Bangladesh Government in exile. He received the Ekushey Padak awarded by the Government of Bangladesh in 2009. He was a Coordinating Lead Author of the Intergovernmental Panel on Climate Change (IPCC)-Third Assessment (completed in 2001). He was also the Lead Author for IPCC Fourth Assessment (2004-2007) and is a member of the 2007 Nobel Peace Prize winning UN Intergovernmental Panel on Climate Change (IPCC) Team. He is also the Coordinator of Bangladesh Climate Change Negotiating Team, and a Member of the UNFCCC Clean Development Mechanism (CDM) Executive Board. He has played a key role in preparing the Bangladesh Climate Change Strategy and Action Plan (BCCSAP) 2009. He has also been the Convener of the Drafting Committee for the Country Report of Bangladesh “Rio 20: National Report on Sustainable Development” for the Brazil United Nations Conference on Sustainable Development (June 2012).